Thanks. I hadn’t noticed. I scheduled it when i was out last night and missed a step so did it again, but the first attempt must have worked anyway. Luverly warm, sunny morning in North Welly with the only the merest hint of a southerly breeze. I blame the government. The birds have cleaned up the bird table, cat bix and all. What a charmer ! Who are the camera shy wee fellas ? He looks as if he’s being given a lesson on the right to do whatever it is, with Bluey checking to make sure that Alex ‘gets it’. Does Alax take after Granddad? Can’t you just hear Bluey telling him how to do it, and asking him if he can show dad how it’s done ? And telling him off when his attention wanders ! It’s an absolutely gorgeous Spring day at Pookden Manor. Even a slightly cool Southerly zephyr can’t cool the sun’s heat; in fact it makes it a lot more pleasant. One can potter about on the estate in the sun without getting overheated. Just spent a delightful hour so down at the Eel Spot, feeding Elvira & young Eli. The stream’s still running about 6 inches higher than normal as it slowly subsides from yesterday’s steady rain. But the water’s now crystal clear again. It’s always interesting to see what has changed on the stream bed when the stream’s been in flood with heavy rain. Rocks move or disappear. Coloured bits of pipe of brick appear among the stones. Stumps and obstructions are cleared away downstream somewhere. Sometimes new obstructions that have come down from upstream appear and stay there until the next heavy rain. When the stream’s this high the current is very strong, wide and fast. So I was curious to see whether any eels would answer my dinner call and was happy to see two did, and that it was these two. Elvira is more streamlined than Ella, has a more engaging personality, is a great mover – very lithe, compared to Ella’s stateliness, and Elvira is a lot more patient with Eli, doesn’t immediately chase him off if he wants to be fed in the same place as her. After I came up I watched them down in the stream for a while, both continuing to swim race-track style circuits up and downstream.Given how fast and strong the current’s running I was intrigued to see how powerfully Elvira was able to swim upstream in it. Although she was generating a heck of a lot of thrust in the water, from up top I could see that it still only required her to ripple her body – with maybe a slightly wider sweep of the very tip of her tail to give her that extra push. Where have all the local eels gone ? I can’t remember when I last saw one. They are, as I remember, smaller and blacker than yours. Roughly as round as a bike inner tube. 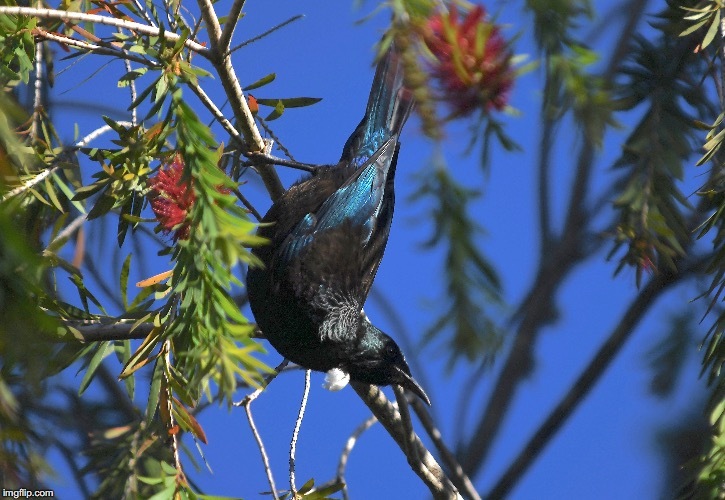 I CAN HEAR A TUI TUING IN A TREE ! It’s really summery up here; a great drying day, I should be out pruning, but can’t be bothered. The bloody grass has grown again, already. Yeah … my lawn needs another mow already too. I better get on to it tomorrow. Today is the perfect day for a lazy afternoon. Might even have a nap in the sun, for some reason last night I was wide awake down at ma’s place – I could do with some extra zzz’s. Nice. I haven’t seen Turqs Tui today, but he might be around doing his aerobatics later this afternoon. Mama mallard from yesterday is back again, still with her little tribe of 10 yellow and black, and one yellow and brown ducklings. She’s done well. By day two, the average brood of ducklings here goes down rapidly from 10 to about 5 or 6. They look much bigger than the last time I saw them already. Ducklings remind me of little fluffy jetskis. They are capable of zipping across the water and an incredibly fast speed. I often picture how their little webbies must look when they do this – they must just be a blur of movement. There are often some on a nearby pond as well as on the streams, whipping along like little clockwork dux. The two dux down the road might be waiting for a while for duckies to appear. Tui on the power line ! I can see the white feathers !!! Factory reset is designed to send people mad, it has to be. My phone decided to do this and all my numbers were wiped. A lot of words (sic) appeared when I turned it on and I had great difficulty turning the bugger off. This happened twice. Then the icons deigned to return, but Fido’s selfie that was my screen picture was gone. So were my contacts. It was as if I had done factory reset, but I hadn’t, all I did was press the On button. This is still a good photo; not great, but good enough. Someone is having their fireworls tonight. Poor animals in the paddocks who can’t get away from the sight and sound ! Roll on a ban.